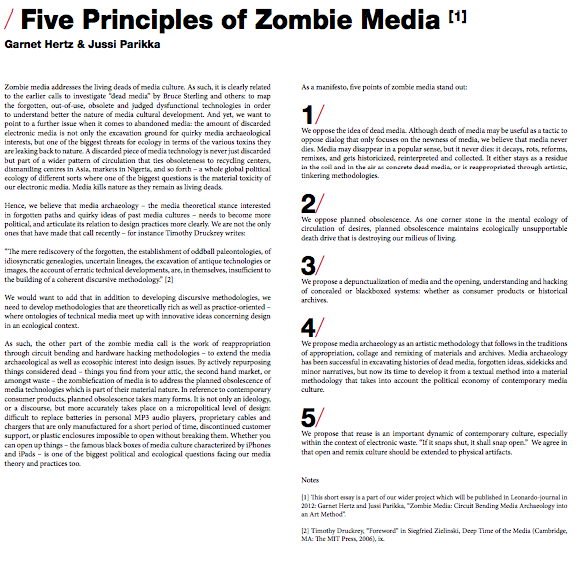 In their coauthored "Five Principles of Zombie Media," Garnet Hertz and Jussi Parikka call for the politicization of media archaeology and the opposition to planned obsolescence (i.e. e-waste). As it is ecologically oriented, this manifesto calls for a practice of media archaeology that reanimates 'out of date' media in new platforms, products, and aesthetic practices.